South Africa on Monday clinched $8 billion in infrastructure deals with France during a visit by President Francois Hollande, boosting government efforts to tackle a flagging economy and sky-high unemployment. 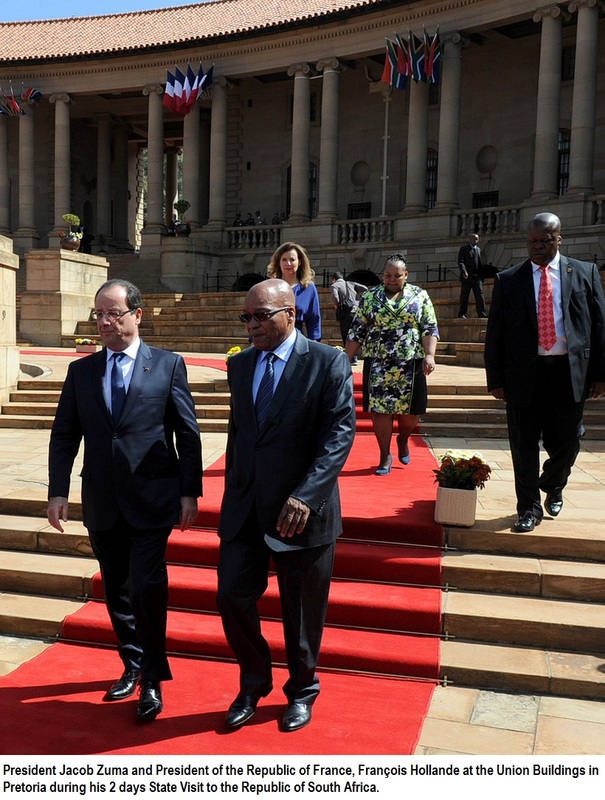 Hollande kicked off a two-day visit to Africa’s largest economy by signing energy and rail deals with his South African counterpart Jacob Zuma, with the two leaders pledging to balance trade between their countries. An agreement was signed between French energy firm “GDF Suez and South Africa for a thermal power plant to the tune of 1.5 billion euros ($2 billion), and also for a solar plant,” Hollande said at a press conference. Energy-strapped South Africa has embarked on a multi-billion-dollar building spree to set up new power plants that would double electricity supplies over the next two decades. A decade of economic growth caught up with the state power giant Eskom in 2008, forcing massive electricity outages that crippled key mining and production industries. Eskom is developing two new giant coal-fired power stations, at least one of which has suffered heavy delays. Hollande did not give further details on the energy deal in South Africa, which gets 90 percent of its electricity from coal and is exploring nuclear energy as well as shale gas in a bid to reduce this reliance. Hollande’s visit is the first by a French leader since Nicolas Sarkozy travelled to Africa’s economic powerhouse in 2008 as part of a drive to seek new partnerships beyond France’s former colonies. “France stood by your side during the years of oppression and it will be at your side during the development years ahead,” said Hollande. South Africa received a gloomy warning from the International Monetary Fund this month that it was trailing other emerging market economies and must quickly implement reforms if it wants to avoid a crisis. The IMF, in an annual report on the country’s economy, pointed to painfully high unemployment — officially at 25 percent with some 50 percent of all young people without a job — and sluggish growth of 2.0 percent this year. The two presidents also finalised a $5.4-billion contract for the overhaul of South Africa’s ageing rail fleet by French firm Alstom, which is set to create several thousand jobs. Under the deal, which was first announced in December last year, Alstom will build 600 trains and 3,600 carriages for South Africa’s passenger rail service PRASA over a 10-year period from 2015 to 2025. As part of the agreement, most of the parts used in the work are to be manufactured in South Africa. About 90 percent of South Africa’s current rolling stock is said to date back to the late 1950s. Talks between the two leaders also touched on the various conflicts plaguing the continent, including the unrest in the Democratic Republic of Congo’s troubled east where South Africa is spearheading a UN intervention force. Another issue of concern was the crisis in the Central African Republic which Hollande described as a matter of “urgency” as violence wracks the nation seven months after a bloody coup. South Africa pulled its troops out of the country after 15 of its soldiers were killed when the Seleka rebel coalition seized power. Hollande confirmed that France will support a regional force to be established there under the auspices of the UN with the backing of the African Union. France is still heavily involved in security and peacekeeping in its former colonies where it has often stepped in militarily, and analysts have said it is trying to get South Africa to play a bigger role in continental security efforts. Hollande has tried hard to shrug off the negative image of “France-Afrique”, a term used to describe the secretive use of political and economic influence between elites in France and former colonies.